I always think of crab to be a bit extravagant and never know what to do with it. It’s a pain in the arse to get all that meat out so I just bought it with all the hard work already done. Make sure you get good quality crabmeat and none of that hideous seafood extender. 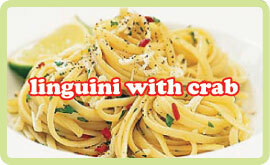 Like all good Italian pasta dishes, the ingredients are sparse and the cooking simple. In a pestle & mortar or with a hand blender, (pulse) the crabmeat into a rough pulp and set aside. In a large pan, heat the oil over a medium temperature. Add the garlic and parsely and fry for a minute until lightly golden. Add the crabmeat, tomatoes and wine. Cover the pan and let the sauce simmer for 15 minutes, stirring occasionally. Add a little salt & pepper to your taste then remove from the heat. Meanwhile cook the pasta to the packet instructions. Drain, reserving a little of the liquid. Return the pasta to the pan with a tablespoon of olive oil and combine well. Add the crab mixture and toss to coat all the pasta. Add a little of the reserved liquid if neccessary to loosen it up. Serve immediately. Sprinkle with more chopped parsley and serve with some tasty garlic bread.